Apologies for the variable audio quality, due to circumstances beyond our control. 4 shooters discuss the pro's and con's of shooting DSLR vs conventional video footage. In-depth discussion of what DSLRs are good for, where this technology excels and when to use conventional video technology. Featuring a wide array of DSLR and video footage to show the differences between the formats, and how each performs in similar environments. To see the full video please click here. The March 2009 Editors' Lounge was a very special event featuring a moderated discussion with a panel of distinguished editors. Editors representing all the major fields of their craft from film to reality television to online editing and more, were on hand to discuss the paths they took to become the editors they are today and talk about the craft of editing. The overflow crowd had the oppurtunity to ask questions afterwards. The discussion panel included 2-time Oscar™ nominated film editor, Billy Weber, seasoned finishing editor and colorist, Terence Curren, veteran reality-television editor, Glenn Morgan, and Emmy™ nominated trailer editor, Carol Streit. The discussion was deftly moderated by Debra Kaufman of MobilizedTV.com. Editing Careers Part 1 from Editors' Lounge on Vimeo. Editing Careers Part 2 from Editors' Lounge on Vimeo. Five-Day DSLR Workshop A Success! New Dates Announced for Three-Day November Class! 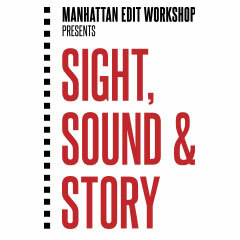 Due to the popularity of Manhattan Edit Workshop's new Five-Day DSLR Filmmaker's Workshop going on this week, MEWShop has announced new dates for our Weekend DSLR version November 19 - 21! Check out video from this week's workshop and details from the upcoming Weekend workshop! 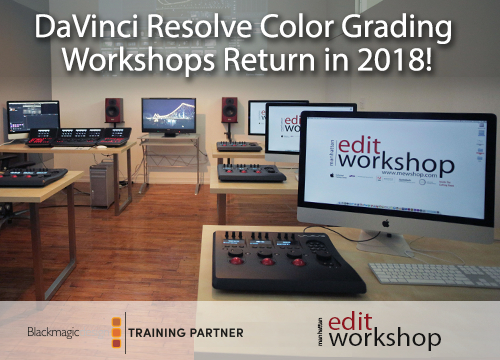 Through hands-on exercise and demonstration, instructors Josh Apter and Jem Schofield will lead you through camera set-up, shooting and editing with the most popular HD-DSLR models on the market. 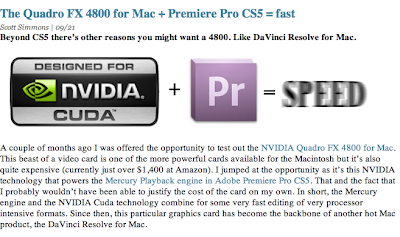 • HD-DSLR overviews and popular models. • Best shooting practices, shortcomings and workarounds. • Shooting video like film. • Camera support systems and “tricking out” your DSLR. • Lenses, adapters and how to use them. • EZ setups and proven workflow techniques. Meet and greet on Friday July 30th from 7pm - 9pm. Class runs Saturday July 31st & Sunday August 1st, from 10am - 5pm (lunch will be provided on each day). What is DSLR & Digital Cinema? Registration is under "Special Workshops" on the registration page. Register here. 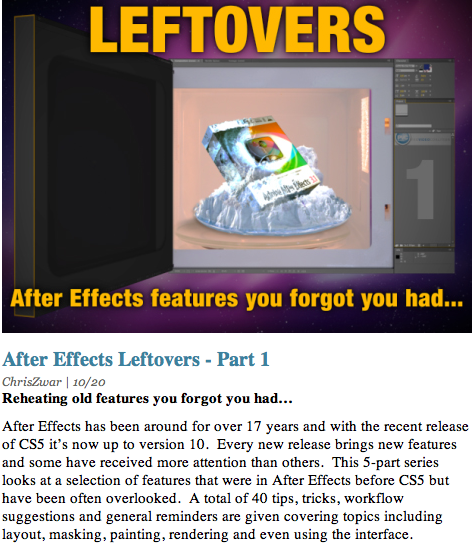 This is a five part series focusing on the overlooked features from After Effects CS4. To read part four click here. To read part five click here. To see video of the interview, please click here. NEW iPhone Application Development Workshop at Mewshop - November 15 - 19! EARLY BIRD ENDS SOON!!! At 200,000 apps and growing, the world of iPhone Application development is completely changing both the creative and commercial landscape. Manhattan Edit Workshop’s Art of the App puts the power of imagination in your hands. This five-day workshop introduces students to writing iPhone applications in the XCode Integrated Development Environment (IDE), using the iPhone Software Development Kit (SDK). This course is for those who wish to learn how to program with Objective-C and build basic iPhone applications using XCode. Students with completed projects will distribute their applications through the iTunes App Store at the end of the course. How to finalize and upload your app to the iTunes Store. Familiarity with object-oriented programming languages and experience with an integrated development environment (IDE). Note: The application fee for the iPhone Developer Program is $99. Objective-C utility classes (numbers, dates, arrays, dictionaries, files, etc). Week Intensives are 10am-6pm, Monday through Friday. Early bird price will be reflected after registering.